Martin Carabott will be the first chef to take over the Tasting Room restaurant at Rathfinny, as the estate welcomes a series of chefs this spring. 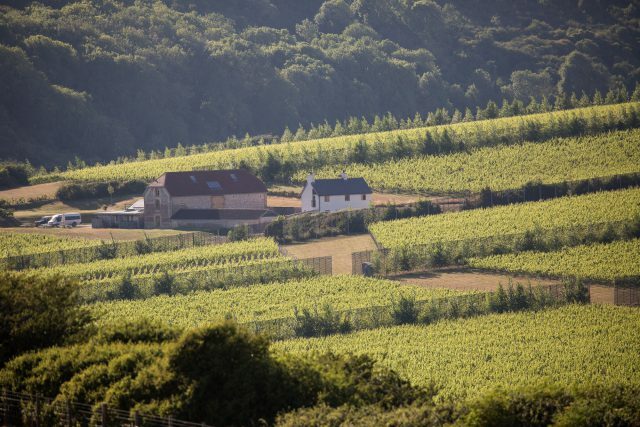 Established in 2010 in Alfriston, Sussex by husband and wife team Mark and Sarah Driver, Rathfinny released its first English sparkling wine last year. Located within the winery, the Tasting Room restaurant offers guest views over the vineyard, with a menu devised by chef Chris Bailey providing seasonal, contemporary British cuisine to pair with the Rathfinny wines. The Tasting Room restaurant will offer a series of guest chef takeovers, with Martin Carabott the first chef to participate. Further chefs are to be announced. The 2018 Roux Scholarship winner and sous chef for Ollie Dabbous at Michelin-starred Hide in London, Carabott recently returned from three months at three Michelin-starred Eleven Madison Park in New York, which was named Best Restaurant in the World in 2017 by the San Pellegrino ‘World’s 50 Best’. The chef’s menu at the Tasting Room promises to be modern European, featuring dishes such as a Cheddar shortbread with russet apple and poppy seeds; a tomato and lovage tea; a mushroom bun and butter; Wiltshire trout slow cooked with wild garlic, radishes and egg yolk; spring peas and marigold agnolotti in a light broth; Herdwick lamb cooked over embers with parsley, charred onion and Sussex Slipcote; and a dessert of ripe banana with limes, rum and toasted milk. Carabott will be at Rathfinny on the 12 – 14 of April for Friday, Saturday and Sunday lunch as well as Friday and Saturday evening dinner, with the lunch and dinner priced at £45 and £65 respectively. Further information can be found here.